Stacie was nervous and unsure of what to expect, dreading that Val Heart might confirm the bad news. Her friends, family and vet told her she was crazy, that she should just put her sick cat to sleep and get it over with. But something told her that wasn’t the right answer. Her sister had badgered her for months to ask me for help and she’d finally given in. 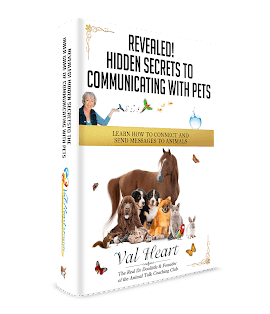 She called Val for animal communication help because she wanted to find out what was really wrong and what her cat really needed from her. Her heart breaking, she was losing sleep, couldn’t focus, and was having trouble working. A young woman, her own health was bad and getting worse. Her doctors had been unable to help her because they weren’t sure what was wrong with her. She was at her wits end, feeling like she was on the verge of a nervous breakdown. Her family didn’t know what to do to help her but were extremely concerned. When Val spoke with Stacie’s cat, we discovered that she was in bad shape primarily because of a very poor diet of commercial ‘junk food for cats.’ Her human thought she was giving her a good food brand, but in fact it was full of chemicals, preservatives, by-products, coatings, dyes and flavorings. The cat’s digestive system was collapsing under the toxic load, and her kidneys were in danger of giving up altogether. Compounding the problem was all the worry, fear and fretting her human was doing which wasn’t helping things. Cats typically are here to serve us by protecting us psychically and emotionally. When we are out of balance, overwhelmed with stress, or under some kind of psychic or emotional attack, our cat companions will act out, telling us to wake up and pay attention. Our animal companions are in many ways our best friends, and they often know us better than anyone else. They choose to spend their lives with us, helping us heal, loving us when we’re sick or sad or mad, often showing us what unconditional love means. They touch our hearts and help us find our way when we’re lost. Unfortunately, they also mirror our issues and wounds, reflect our pain, stress and anger, sponge our grief, sadness and dis-ease into their own bodies. When they get sick or act out with behavior that is inappropriate or even life threatening, they are asking for help, telling us that the load they are carrying for us is more than they can bear. The good news was that Stacie’s cat friend wasn’t ready to die, but simply needed an improved diet, less worry and emotional upset, and they both needed a few healing treatments with the BodyTalk System for animals and people. The BodyTalk System, developed by IBA Global Healing, is an astonishingly simple, safe and effective form of holistic therapy that allows the body’s energy systems to be re-synchronized so that they can operate as nature intended. Each system, cell and atom is supposed to be in constant communication with each other at all times, allowing us to be adaptable and flexible in life. The benefits of a Heart Style BodyTalk session are especially designed for animals and the entire family too. As is the case with human beings, exposure to stress can lead to disease and malfunctioning within an animal’s body. The understanding that animals deserve their own type of BodyTalk inspired the evolution of BodyTalk for Animals. Through exposure to the stresses of day-to-day life, these lines of communication become compromised, leading to a decline in physical, emotional and/or mental health. It is critical that these systems be perfectly balanced for the body to effectively coordinate the billions of synchronized activities per second that are necessary to maintain optimum health. Reconnecting these lines of communication enables the body’s mechanisms to function at optimal levels, preventing disease and rapidly accelerating the healing process. The BodyTalk system for animals can be used as a stand-alone therapy to help with many health problems, or be seamlessly integrated into any health care system to increase its effectiveness and promote faster healing. It is non-invasive, objective in application, and works quickly and effectively on humans and animals alike. BodyTalk for animals in combination with animals communication and intuitive scanning has proven to be extremely helpful in addressing many behavior problems, as well as many common health problems such as allergies, environmental sensitivities, dyslexia, chronic viruses and infections, depressed immune systems, brain trauma and dysfunction, sugar metabolism disorders, arthritis, musculo-skeletal pain, emotional, behavioral and psychological problems, among many other problems. In addition to Val’s animal communication and intuitive scanning services, as an advanced PaRama level BodyTalk practitioner she also specializes in Human Animal BodyMind Connection and Assessment work. Her unique understanding and application of the BodyTalk™ System of healing therapies for both humans and their animal companions is often an extraordinary experience with amazing and fast results. Because of the Human Animal BodyMind Connection mirroring principle, Val often requests that the human caregiver/owner receive treatment first, then works with their animals to get the best results as quickly as possible. When should you consider getting a BodyTalk for Animals session? If you and/or your animal friends could use a profound level of healing through the BodyTalk system for animals, click here to make an appointment.